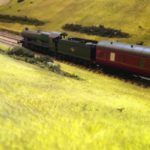 Do something different with your model railway scenery and landscape and create the 2018 summer heat wave in miniature. It won’t have escaped your attention that for the last few months we’ll have an incredible run of hot, dry, weather. And this isn’t just in the UK, where I’m based. In Germany, it’s been equally hot and dry and Madrid and Portugal are even hotter. And in Australia, where this blog has a large following, it’s dangerously hot even. According to the TV news, New South Wales is cooking, despite it still being only being Spring. 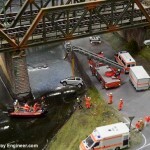 But what has this weather report got to do with model trains? 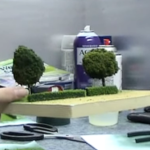 Traditionally, much model railway scenery has the green and pleasant land look typical of England in the steam era. It’s rare to see a layout without lush trees and verdant fields. Yes, I’ll put my hand up and confess that ALL my layouts have this look. But the recent hot weather coupled with a lack of rain has turned much of our green and pleasant landscape into scorched earth. Just look at this image taken by German astronaut Alexander Gerst. He was shocked when he saw how brown his homeland had become. What was once all green is now brown. 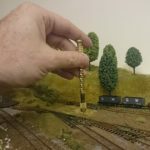 So why not do something different, capture the hot summer of 2018 in miniature form and give your layout a unique look. Green fields look nice and all that but they get a bit samey after a while! 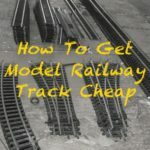 It’s something I’ve now decided to do with my modern era OO/EM Gauge shed layout and frank,ly I’m looking forwa to the change of scenery…. To create brown fields and grass is actually really easy. It’s just a case of using static grass or grass matts as you would normally but using brown grass instead of the usual lush greens. The problem is finding suitable brown static grass. I’ve previously written about creating your static grass from teddy bear fur and initially thought it would just be a case of doing this but skipping the colouring steps. Teddy bear fur is brown after all. It’ll look like brown grass right? Dried grass in fields has a yellow tint to it with patches of darker areas. The teddy bear fur brown was the wrong shade and lacked the variation. Instead, I’ve found a ready-made perfect static grass. It’s by WWS. A mix of their dead and patchy static grasses with the occasional scorched grass tuffs work perfectly. 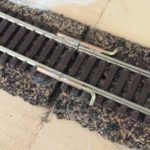 They also do them in 1mm, 2mm and 4mm so can be used for N, OO and HO scale. Application is as usual with a static grass applicator like my my prefered one and a suitable glue — PVA etc. The results are superb. WWS deserve a lot of credit for their authentic grass, it really looks the part and perfectly recreates the look of fields this summer. On the torched fields of this Summer, crop marks — where buildings and monuments once stood — are even more visible with the location of undiscovered ancient buildings being revealed for the first time. 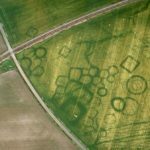 If you create sunburnt fields, why not introduce a few cropmarks of your own to your fields. It adds uniqueness to your layout. To do this read my post on creating crop marks.